Go East: The Gene & Brian Sherman Contemporary Asian Art Collection and Yang Zhichao: Chinese Bible are the results of an ambitious collaboration between the Art Gallery of NSW (AGNSW) and long-time philanthropists and art collectors Gene and Brian Sherman. A curated selection from the Shermans’ private collection sees 20 featured contemporary Asian artists and 31 works situated across two venues: AGNSW and Sherman Contemporary Art Foundation (SCAF) in Paddington. 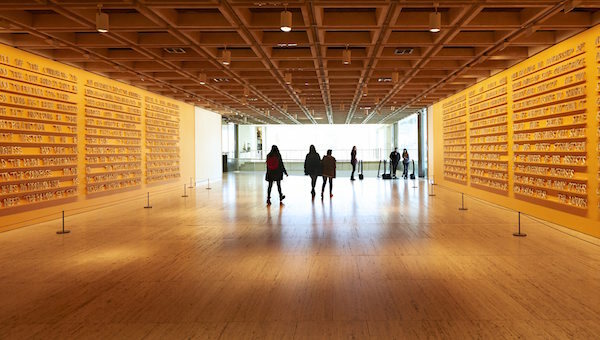 The shows are a snapshot of a comprehensive collection amassed over the last three decades, and include two generous donations to the AGNSW’s permanent collection. Curated by the AGNSW Director of Collections, Suhanya Raffel, the invitation into this sampling of the Sherman collection begins the moment you step inside the AGNSW vestibule. Chinese artist Lin Tianmiao’s Badges (2009) are suspended from the ceiling, hovering like jellyfish underwater. Enter further and the bright orange walls that line the foyer space before the escalators are unmistakably eye-catching. Lined with resin sculpted bones that form letters of the alphabet re-invoking Mahatma Gandhi’s history making speech in 1930, part of Gandhi’s legacy of peaceful protest, this is Indian artist Jitish Kallat’s Public Notice 2 (2007), the first donation from the Sherman collection. Upstairs is an ambient, intimate experience of the remainder of the show at this site that inspires contemplation. The rectangular room is bookended by two immediately striking works: Nortse’s Zen Meditation (2012), featuring 6 monks’ robes encased in metal frames with artefacts denoting the turbulent and persecuted history of Tibetan Buddhists; to the other side, a suite of nine larger-than-life photographs documenting Chinese artist Zhang Huan’s introspective performance, Family Tree (2000), reflecting on his change in geography from China to New York. The room also features two works by contemporary art darling Ai Weiwei alongside other prominent artists in the landscape of contemporary Asian art. Of Samoan and Japanese descent, Shigeyuki Kihara’s photographic series is one of the more memorable works in a show mostly comprised of artists from China, Japan and Vietnam. The inclusion of artists from India, Samoa and the Philippines subtly expands the obvious understanding of ‘East’. It also becomes apparent that many of the works are responses to political, historical or socio-economical issues while a few are profoundly personal, striking a balance that involves the viewer both intellectually and emotionally. Across at SCAF you can view the second donation from the Sherman collection, Yang Zhichao’s Chinese Bible (2009) (curated here by Claire Roberts), which will enter the AGNSW permanent collection at the conclusion of this show. 3000-odd books, collected by Zhichao at various marketplaces over a 3-year span, stretch out like a sea of hidden stories, presented in a gridded layout largely determined by size. Zhichao is well known for his endurance performance art so there is inevitably a performative aspect, here in the form of video documentation of the methodical cleaning of each book. The cleaning represents the transformation of each object into art and this sense of duality exists on several levels in this body of work. There is the book as a stylistic object in its own right, the private notes within representing a single life, whilst collectively the books reveal a national history experienced through a culture where the dynamic of uncompromising uniformity was favoured and enforced in Communist China. Accompanying Go East and Chinese Bible are three impeccably compiled publications that canvass the artists, artworks, curators, collectors and directors that have contributed to this project. As well as chronicling the two exhibitions, these books are a comprehensive introduction to the world of contemporary Asian art, providing a history of Australia’s relationship with Asia through the arts. Go East: The Gene and Brian Sherman Contemporary Asian Art Collection and Yang Zhichao’s Chinese Bible provide a selective and succinct overview of some of the major players in contemporary Asian art. This project also highlights how valuable a private art collection can be when public access is facilitated, and touches on the importance of collectors in supporting artists and the production of new work. This is increasingly pertinent in a changing funding landscape, where private philanthropy looks to play an even more vital role in the support of individual artists.